NASA's website full of excellent educational resources. I just did a quick look through my archives and over the last few year I've written about NASA-related topics more than sixty times. Here are five of the most popular NASA resources for teachers and students that I've covered over the years. NASA's Lunar Electric Rover Simulator is a free iOS app that lets you explore the moon. The app is really a game in which players perform tasks to support the activities of a lunar outpost. Players transport items from place to place and along the way encounter lunar challenges to overcome. The app also includes an interactive gallery of images. You can download the app for free from iTunes. NASA @ Home and City is a virtual tour of NASA-related science in our homes and cities. Students visiting NASA @ Home and City can rotate buildings and take a look inside to discover everyday items whose development has been influenced by technology developed at NASA. Each item within a building has a narrated explanation of how that items was influenced by NASA technology. For example, students can take a look inside the bathroom of a house to learn how cosmetics have been influenced by technology used at NASA. 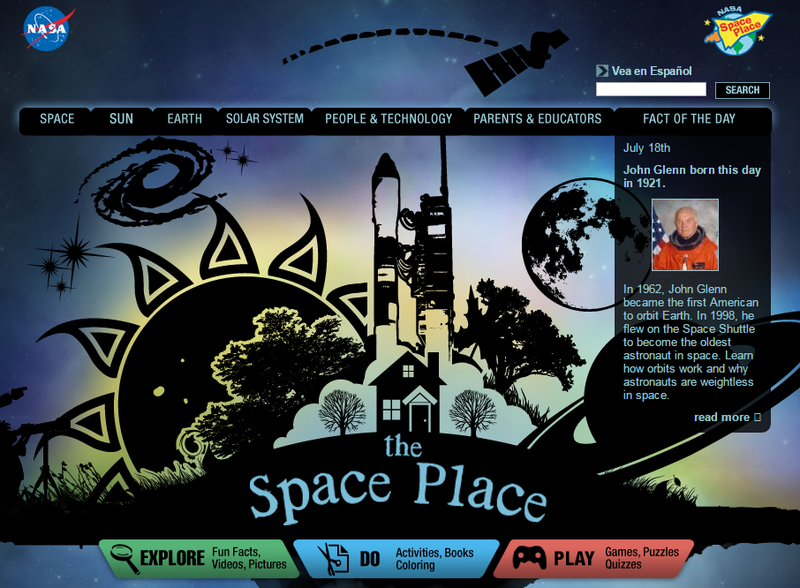 NASA Space Place is a sizable collection of fun projects, games, animations, and lessons about Earth, space, and technology. Before playing the games or attempting one of the projects, students should explore the animations and facts sections to gain some background information. The projects section of NASA Space Place provides teachers, parents, and students with directions for hands-on projects like building a balloon-powered rover, building relief maps, and building a moon habitat. The games section offers thirty games covering all of the subjects in the animations and facts sections. NASA has an excellent interactive timeline tracing the history of astronomy and space exploration from the Greek philosophers through today. Planet Quest is actually three timelines combined into one. The three timelines cover technology, discovery, and culture as it relates to astronomy and space exploration. Each element on the timeline is narrated. Users can select individual elements on the timeline or choose autoplay to hear the narration of each item in sequence.